Bro. Martin Ampomah had the opportunity to follow his father as the Chief of the Ashanti tribe there in West Africa but chose rather to follow his call to be a Christian Minister. One day the Lord asked him "to go buy some groceries, take them home to your wife, Margaret. Tell her to prepare a meal and go to the airport for you are about to have company." At the airport Jim and Barbe Brunner were stranded. They had come to Accra, Ghana in response to an invitation from a denominational Bishop to share in his Churches. He had been with the Brunners in Colorado the year before and had wanted his pastors to see that a couple could minister together effectively under the anointing of the Lord. But neither he nor any representative of his church showed up at the airport. The Brunners had no other contact. When Martin arrived at the airport and saw the two white faces he called to us and we all knew it was the Lord's appointment. Martin and his wife, Margaret, shared their hospitality and the opportunity to minister in their Churches. We were impressed with the work and the Bible School. Since the early 1980s JBMI has helped fund their ministry called Harvesters Evangelistic Ministries. There are four men on the Board of Directors. 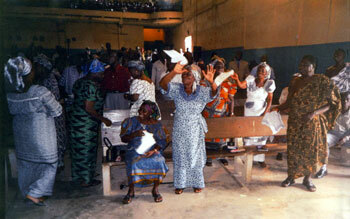 Their ministries have touched many lives in West Africa through the Churches and pastors from the Bible School. One of our latest projects is helping Martin build his first home. Pictured below is a picture of this home and with our help will soon be completed. It is being paid for as it is built and has been three years in the building at this point. They still need the electrical and plumbing done as well as the ceiling and plastering. Pray for the soon completion of this home for a precious and caring Ghanaian educator and pastor. Any state side donations to this ministry may be sent through JBMI for a tax deductible receipt. 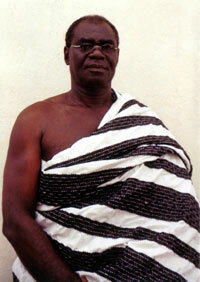 Martin himself and his thriving work may be contacted by writing him at PO Box B104, Bantama, Kumasi, Ghana, W.A. Their email address is matin2gh@yahoo.com. Recent communication from Martin Ampomah indicates that a number of new Church plants have been built with financial help from outside the country. A large Church plant is being built in Kumasi, Ghana. It seats 1200 people with rooms for the children's education as well as extensions for the Bible School. This building begun in 1997 is just now to the point where it can be used. The people tithe and give even more in offerings for the works yet there is a need for outside support and assistance to complete the work. The dedication of these Ghanian Christians is illustrated by the story of Martin himself. He was born in line to become the next chief of the Ashanti tribe in that country but when he found Christ as his Master he turned from that traditional position with its personal acclaim as a king to pastoring and helping his people find the peace that comes from being born into the Kingdom of God. The congregation in the city of Kumasi is growing rapidly. They love to worship and are working hard to share the good news of Christ all over the country. Islamic opposition is growing from the north. As the international news from West Africa testifies, the northern part of the nation is predominately Islam and the opposition is fierce. Their Christian evangelistic campaigns are conducted mainly by the pastors and converts whom the Lord have brought into the Kingdom through this ministry. These saints and their pastors are being trained in the Bible School. The work needs our prayers, sponsorships and support. The Church plant needs to be completed. Bibles and literature for the children and the Pastors School are needed. The US Dollar can do so much in that country right now. Do pray about helping with support and prayer.